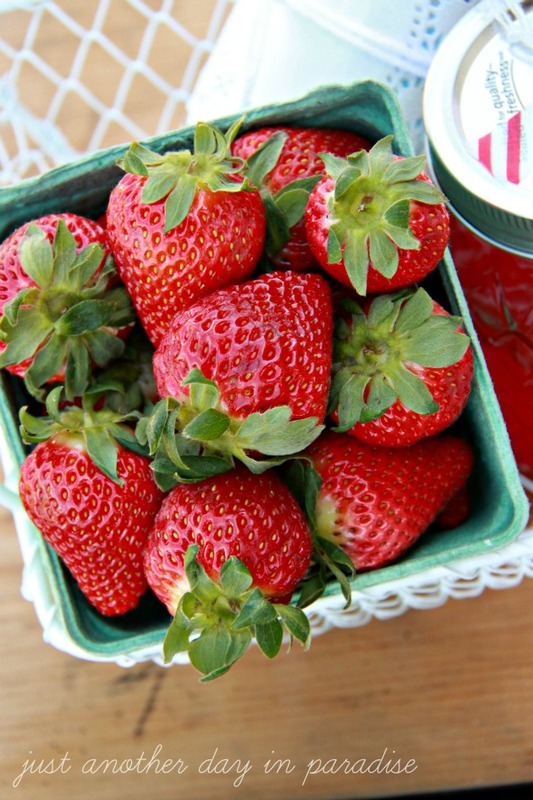 Strawberry season is closing in. Are you as excited about that as I am? Where strawberries are there is strawberry frozen yogurt, strawberry lemonade, strawberry pie, strawberry spinach salad, strawberry jam, and of course Strawberry Shortcake. I recently had a few friends do me the biggest favor ever. They watched my three older little men while my littlest man and I went on a week long trip. There is no feeling like not having to worry about where your kiddos will be during the day while you are out of town. That kind of peace of mind deserves a really a big THANK YOU. A BERRY special kind of Thank You if you will. Hahaha. 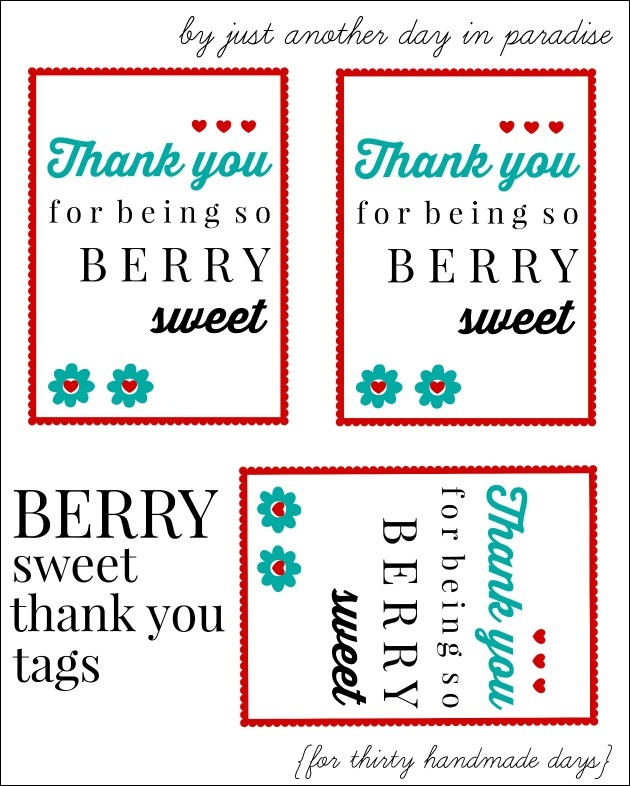 We all have people in our lives who are BERRY sweet. There are teachers, neighbors, friends, moms, and so many others all awesome enough to be thanked with Strawberry Shortcake. 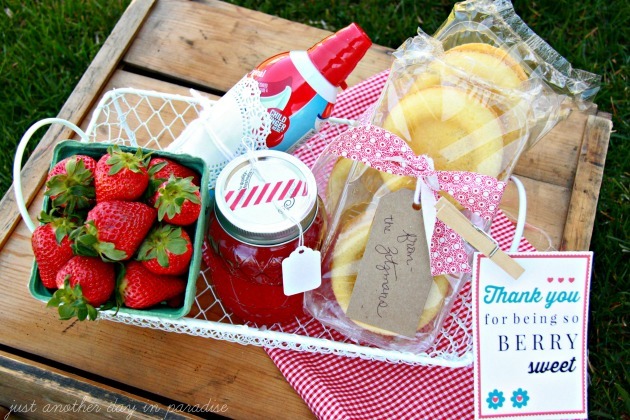 Making your own Thank You Strawberry Shortcake Kit is really easy. Just gather up all the stars of the show. Starting of course with the leading lady. Strawberries. Then we have whipped cream. Now introducing the strawberry glaze and cakes of the shortcake variety. Everything is store bought. I simply prettied everything up just a tad. 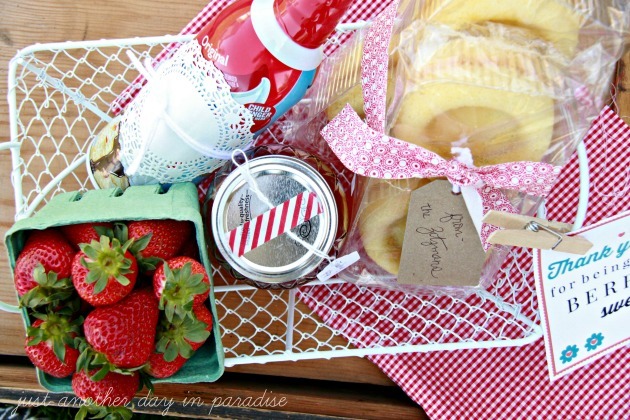 I put the strawberries in a fun paper berry container. 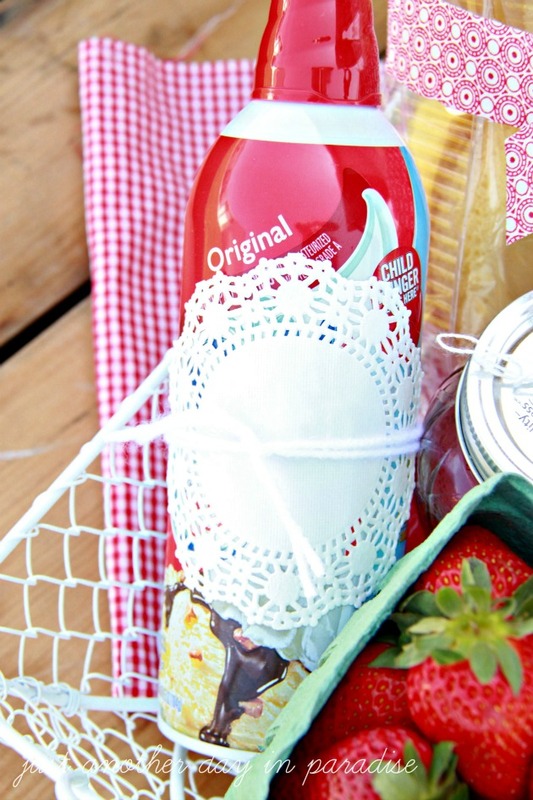 I added a paper doily and yarn to the whipped cream. 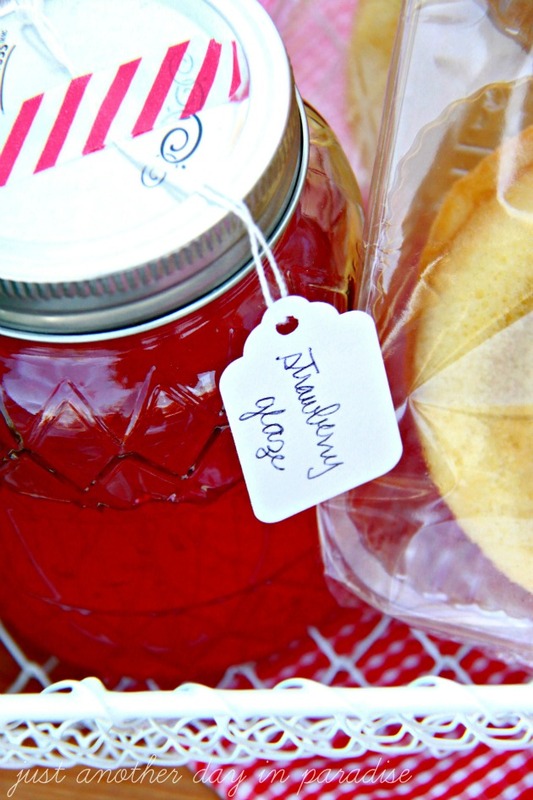 The store bought strawberry glaze found a new home in a fun textured mason jar. 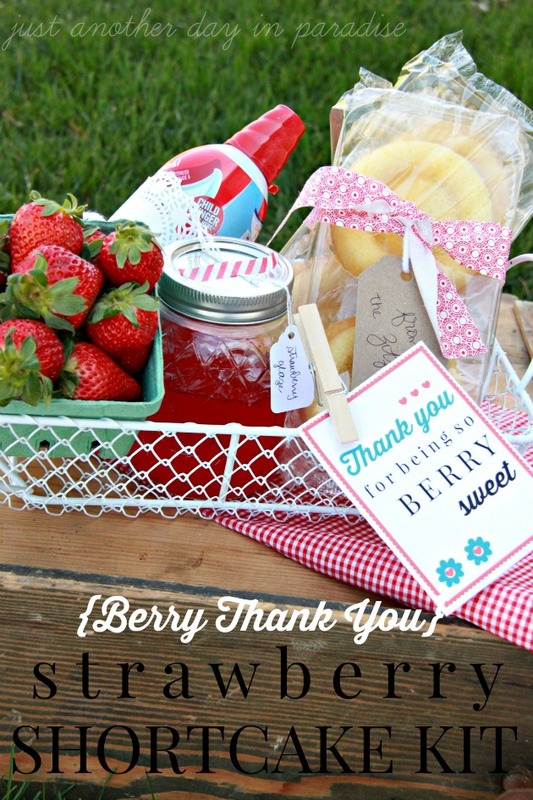 I printed out the Thank You tag and attached it to the basket with a cloths pin. It has never been easier, prettier, and yummier to say thank you to that awesome person in your life. 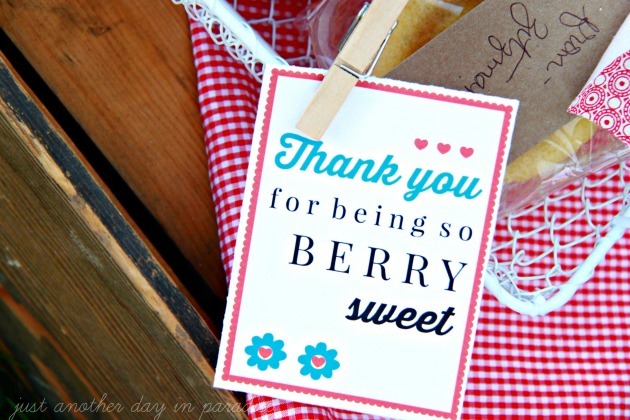 Now I can say thank you to my berry special friends with a little Strawberry Shortcake Kit. I am pretty sure they will be my friends forever now.